What is a bounce card, you ask? Well, let’s say you are shooting your friend standing in a shady spot but there isn’t enough light on her face. 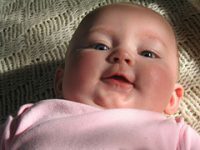 How do you get more light on your subject without bringing a bunch of equipment or moving her to a different location? You use a bounce card, of course. 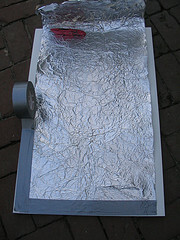 You can bounce light using anything reflective – a piece of paper, some tin foil or even your hand. Try it, it’s easy. Put the palm of your hand in a shaft of bright light and see what it does to the light around you. Then try the same thing with a piece of white paper and look at the difference. While this can do in a pinch, your hand is not a very effective light source and sometimes you will need something larger to bounce in more light. I like to use a smallish piece of foam core as a bounce card. Yes, there are flexible fabric devices that pop open called Flexfills, made specifically for this kind of thing, but they can be expensive (ranging from $50-120). I prefer the low-tech version â€“ a plain white piece of foam core with some tin foil stuck on the other side. This way, if it gets dirty or banged up, I can just make a new one. To illustrate how bounced light works, here are two pictures I took this afternoon of Chloe. I used my digital point-and-shoot camera, set to AUTO with the flash turned off. The first picture is lit solely with the sunlight coming in through the window. The second shot is exactly the same except that I bounced some fill light into the shadows using the foil side of my bounce card. You can see that her face is more evenly lit and the shadow on the left side is much lighter. 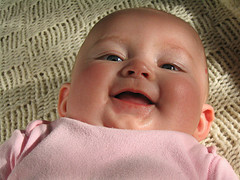 Even with a squirming baby, I was able to hold a small bounce card in one hand and take the shot with the other. Here is how I made this bounce card. I bought a piece of white 20â€x30â€ foam core for the low low price of $1.78. 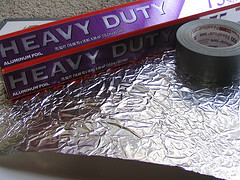 With a few pennies worth of tin foil and some duct tape, voila!, in a couple of minutes I had my own 2-buck, 2-sided bounce card. Why the tin foil, you ask? Well, the white side gives you a very soft, flattering light, and tin foil gives you slightly sharper and more directional light. When making the bounce card, I like to wad up the tin foil a little bit because I like the quality of light that produces. I also like having several sizes of bounce cards so I can control the amount of light I’m adding to a scene. You could also choose to buy foam core that is white on one side and black on the other. The black side can be used to help take away some light (called negative fill) to give the light on your subject a more dimensional quality (meaning less flat). Some commercial Flexfills have a gold foil side that will warm up the light. 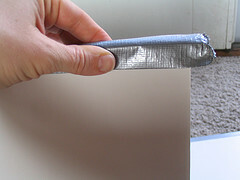 You could duplicate this by using a piece of gold poster board and taping it to your foam core. Next time you go out shooting, throw your homemade bounce cards in the back of the car and experiment!